When you think of summer food, what comes to mind? I know for me a big juicy burger is at top of the list. Picnics, BBQ’s, festivals, a weekend trip to Home Depot – there is no bad time for a burger. Am I right, or am I right? When Bick’s asked me if I would like to come up with my own burger using some of their many burger topping goodies, it was a no brainer. It’s been a week of firsts for me in the kitchen so I was inspired to try another first – deep frying. I know, sounds kinda scary. I was thinking, well I can’t have a burger without fries! then I thought what if I made fried pickles? What if I made pickle fries! It was a very deep conversation I had with myself. 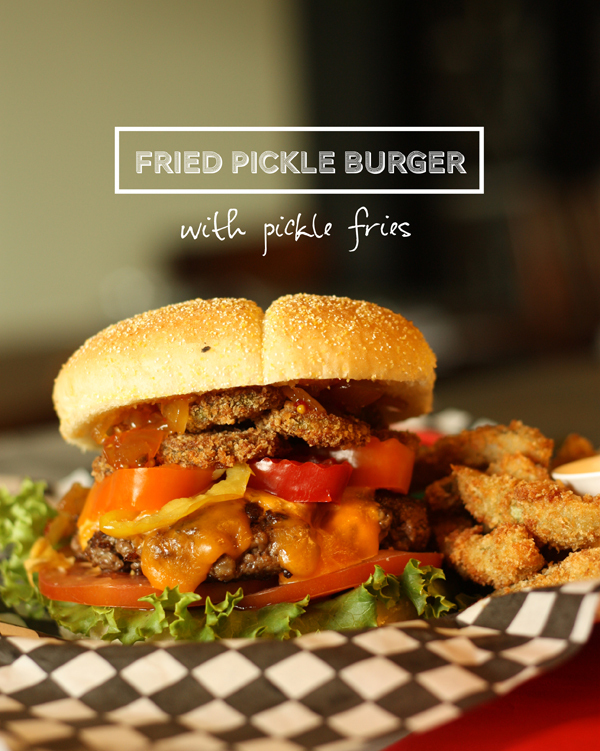 So the end result people is the Fried Pickle Burger with a side of pickle fries. I had an assortment of Bick’s toppings to play with. 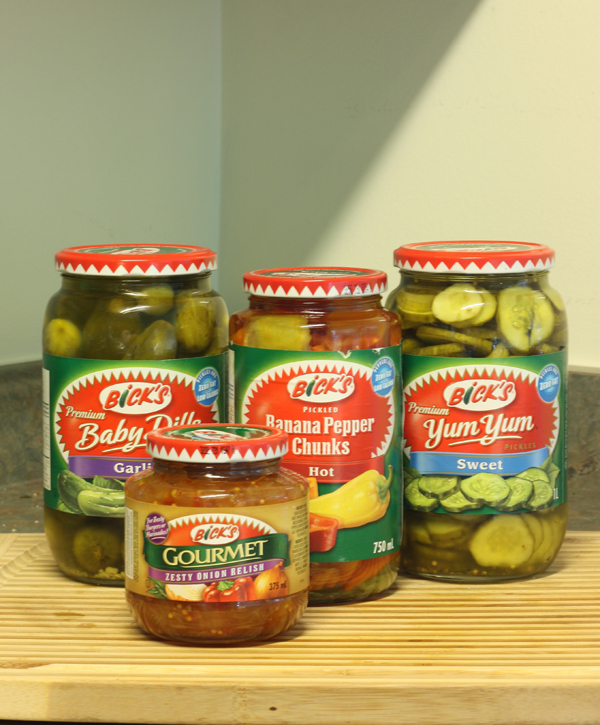 These are the ones I decided would be perfect for my burger – Bick’s Baby Dill’s Garlic, Bick’s Gourmet Zesty Onion Relish, Bick’s Banana Pepper Chunks, and Bick’s Yum Yum Sweet pickles. The Bably Dills & Sweet slices were the star of the show. How do we treat the stars around here? We deep fry them. So first cook up some of your favourite homemade or high quality pre-made burgers. (psst, here’s a great basic recipe) then you get to play with toppings. 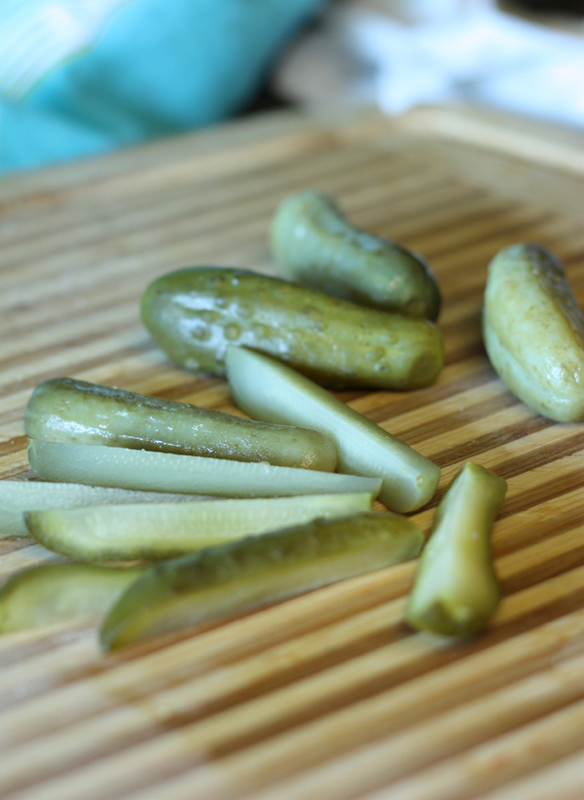 The sweet pickle slices are good to go but I sliced up the baby dills in fry-like slices. Then I coated them all in a basic flour, egg wash, bread crumb mixture (here’s a recipe). How much you need depends on how much you’re making. Season your flour and breadcrumbs as desired, I stuck with salt and pepper to let the flavour of the pickles stand out. Then I proceeded to throw those breaded babies into a hot vegetable oil bath (about 1.5″ high), using a thermometer to keep the temp at 375 F. It was actually super easy, not scary at all. They only took about a minute and out came some golden and delicious fried pickles. I wanted the fried pickles to be the main attraction of the burger so I left them for the top but they definitely had some supporting acts. I also added some Bick’s Hot Banana Peppers and a generous dolop of the Bick’s Gourmet Zesty Onion Relish on the top bun. Delish! Now this guy needs a name. Bick’s is having a Name a Burger contest and I’m still trying to figure out what to name this scrumptious fried pickle burger. Any ideas? In the meantime, head over to the Bick’s website to check out all the burger success stories that need names. 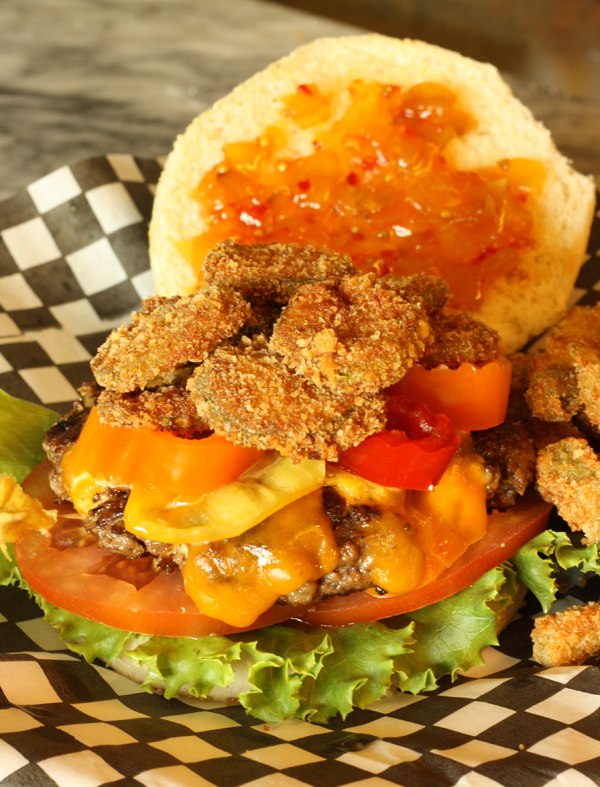 Just by coming up with a name, you will be entered to win 1 of 4 cottage vacations….where you can make as many crazy burgers as you want. At your own cottage. On your own cottage BBQ. Be sure to visit Bicks.ca for the official contest rules as well as a ton of recipes to try (ummm, did someone say Poutine Crunch Burger?) . There’s so many options, the burger topping possibilities are endless. Time to get BBQ’ing…and eating. Like this post? You can find more good eats here. Yuuuuuum!! My whole family are crazy pickle lovers. That zesty onion relish is one of my Favs. I want a bit of your burger, looks to die for! oh my gosh! I literally have goosebumps thinking about this! soooooo yummy! I love fried pickles!! I am DEFINITELY going to try this! I sooo want to try this, dang they look good!! Thanks and for a name, what about “bickurger”? What a terrific idea! Fried pickles are so good. But putting them on a burger isngenius! Looks delicious. Have you ever tried BBQ bacon-wrapped pickles? They’re the best! No! But they sound delicious! Hey, I admire your bravery! Deep frying seems daunting to me! I had deep fried pickles the first time just recently at a wings place…the taste could grow on me, and I bet they’re even better homemade! This was my first time deep frying and I’m happy to say it wasn’t as scary as I thought. The key is to have the oil at a hot enough temp (375). I hope you try one day! Oooh, this looks so good! 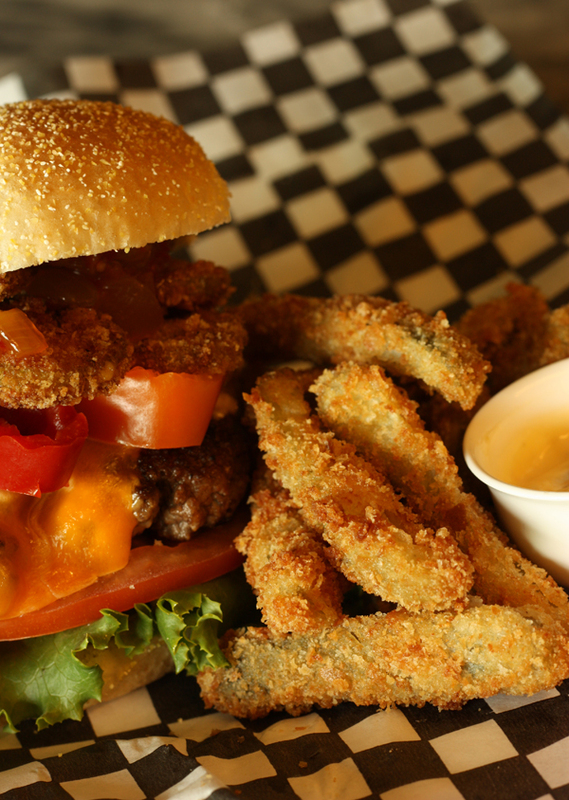 I’ve had fried pickles, but never on a burger. YUM. Mmmm!!! That looks delish, I love pickles. Did your deep fry stay crispy? Every time I try something fried at home, it goes limp before we are ready to eat. Off to check out bick’s! HOLY COW!! I HATE Deep Frying things – so I need to find something like this on a menu somewhere now, because I need this in my life – so much so that I might have to dig out the frier and give this a shot. 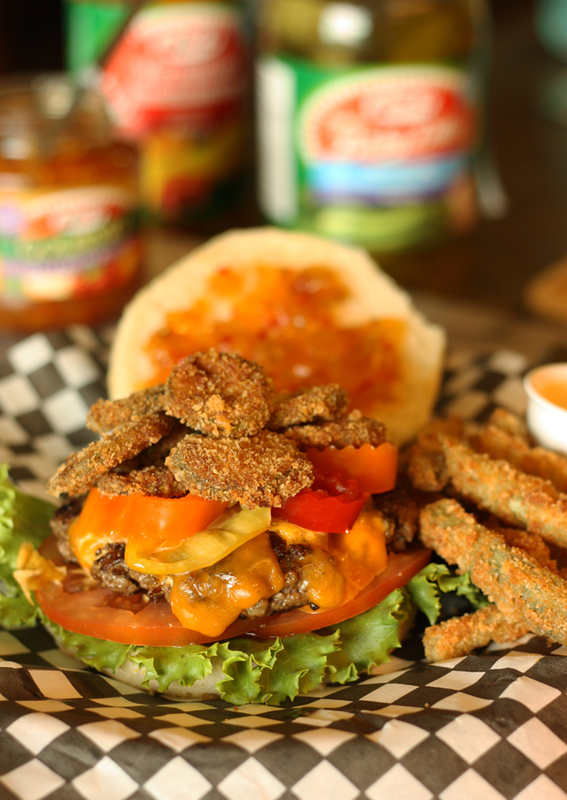 Deep Fried Pickles are my favorite guilty pleasure and then throwing them on top of a great burger with all those other goodies, wow, just wow! Rachel I’m not even a die hard pickle person and I loved it. You definitely have to try if you’re such a pickle lover. The frying wasn’t as bad as I thought. I just did it on my stove in a heavy pot with about 1.5″ of oil. This looks amazing! I’m literally salivating right now. I love pickles. 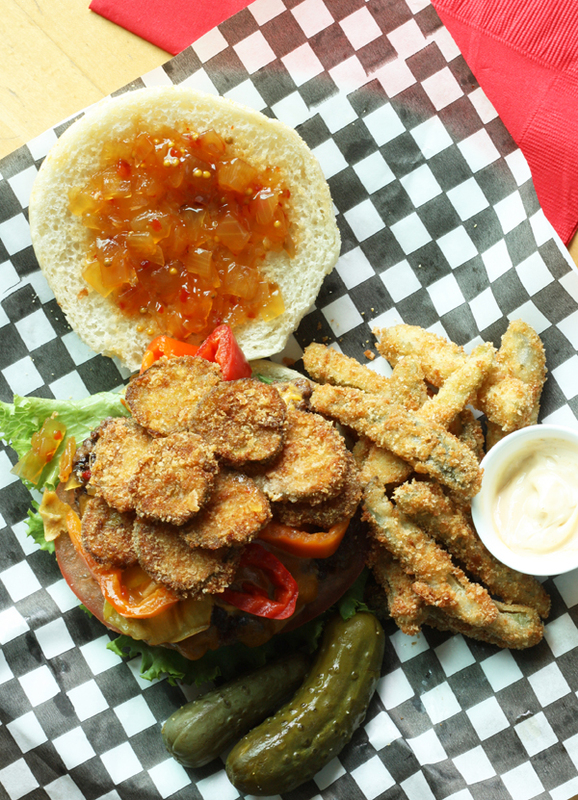 I have never even been tempted to try a fried pickle – but this burger has made me a convert!